Kicking the habit with sheer enthusiasm. What does ‘recovery’ mean to you? Come on, you must have an opinion – it’s been the forums’ favourite for awhile now and regional ripples are turning into waves of action and new networks. David Best and Stephen Bamber decided to harness some of this energy by creating a ‘Recovery Academy’ (page 10), an initiative that got off to an energetic start in Manchester last week. They want to chart evidence of innovation and success – and they might easily start with the dynamic football initiative on page 6. When Alastair Mordey came across this motivated group of young people he could not forget their enthusiasm. But it went further than that. He saw that this group was feeding off its own success, gaining momentum from each other and inspiration from the involvement of professional footballers. 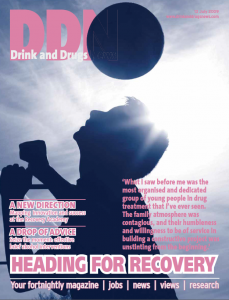 The programme leader, Colm Whitty, was initially reticent about Air Football being featured in DDN because they were quite happy getting on with things – they weren’t actively looking for publicity. But just as they inspire young people to get involved in an activity outside addiction, we thought this group had a motivational spirit worth sharing, so I’m glad they were persuaded. Sheer enjoyment is a massive part of their success (why else would you want to get involved?) and we shouldn’t forget that humour is a vital part of recovering from anything. Neither does a dose of humour go amiss when trying to convey drug safety messages – however serious their nature – as Cumbria Users Project demonstrate so eloquently in their Cup of chocolate film (page 13). The film is stylish and quirky without compromising any hard-hitting messages – you can see a short version via the web address at the end of article, or as a clip on our website’s ‘virtual’ magazine. Incidentally, we’ve needed a bucket-load of humour in the DDN office this week as rain poured through the roof and flooded the place out. I’m still laughing.